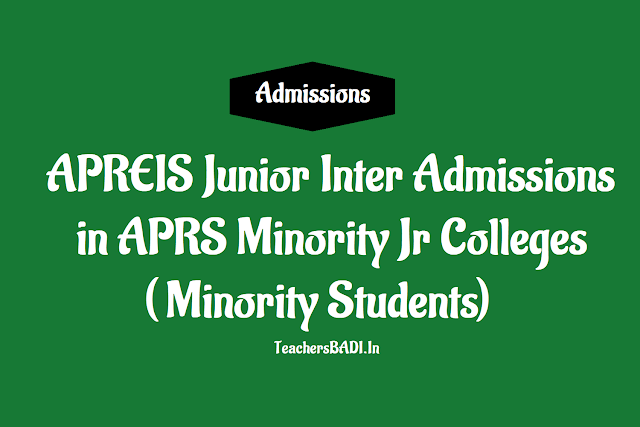 APREIS Admission Notification 2019 for Minority Students | Admission into Junior Inter Urdu medium in APR Minority Jr Colleges | Admission into MPC, BPC, CEC Groups in APR Minority Jr Colleges. APREI Society Junior Inter Admission Notification 2019 for Urdu Speaking Minority Students. The Andhra Pradesh Educational Institutions Society issued Junior Intermediate Admission Notification. This Notification for admission into first year Intermediate Urdu Medium into MPC, BPC, CEC Groups in A.P. Residential Minority Junior Colleges in the AP State. APREI Society invites applications from the students of Urdu Speaking Minorities for Admission into A.P. Residential Minority Junior Colleges. The students should have passed or its equivalent examination with Urdu Medium in March, 2019 in first attempt. Instant or Compartmental pass students are not eligible to apply. 2. Admissions for Urdu medium students will be provided through counselling on ........ by 9.30 am in all Minority Residential Junior Colleges.